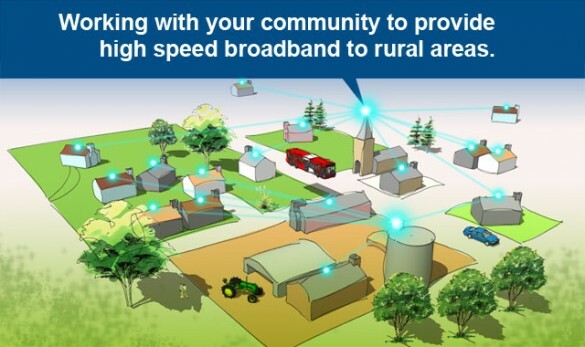 The Parish, like many other rural communities, is poorly served with Internet connectivity services. Unfortunately, our parish lies on the extremity of 4 different telephone exchanges. Broadband service speed is dependent on how far away your telephone cable is from the exchange and as such many of our residents have a poor broadband service. Mobile internet access is also generally limited to slower speed 2G services. In December 2010 the Village Plan group and several Councillors instigated a project to do something about this and to drag our village out of its cyber wasteland. First we had to confirm that things were really as bad as we perceived. The community was surveyed which resulted in this Broadband Report published in March 2011. This indicated that some areas were worse than others with speeds ranging from 0.5Mbps to 6Mbps with 50% achieving less than a 2Mbps service. The speed needed for a reasonable iPlayer service. Following on from the survey, the Parish set to find the right solution. Asking BT to lay some fibre to our cabinets would be prohibitively expensive as is satellite. 3G services are congested and 4G services will not be seen in our parts of the world till 2014 earliest. A provider of wireless broadband services seemed to be the best option. Here the provider would use low cost WiFi technology to create a community network by placing small Community Access Point (CAP) antennas on some strategically placed houses. The signal would then be distributed to any residents that wished to take up the service. A proposal was made by a local provider from Coggeshall, County Broadband. They were just about to roll out their Next Generation Network and Eight Ash Green could benefit from internet connectivity services of up to 32Mbps up and down-load speeds. In December 2011 our community was surveyed again to see what possible take up there would be for such a service. Demand was high with more than 50% of residents expressing a strong interest. The proposal from County Broadband was refined and the Council applied for some loan funding from the Borough Council to establish the initial network. As take-up increased, County Broadband would repay the loan and ultimately make a contribution towards the Parish Council funds. The initial network was deployed in April and May 2012 covering the worst areas in our village in the South-East. A total of 6 CAPs now cover most of our village. A further CAP is planned for the North East area and will be installed in the coming months. Many of our residents now benefit from the new high speed service and more are signing up each week. If you are interested in this service, please give County Broadband a call on 0845 686 5000 or drop me a line.